This large lidded roaster is designed to help you roast poultry and bigger cuts of meat to succulent perfection. 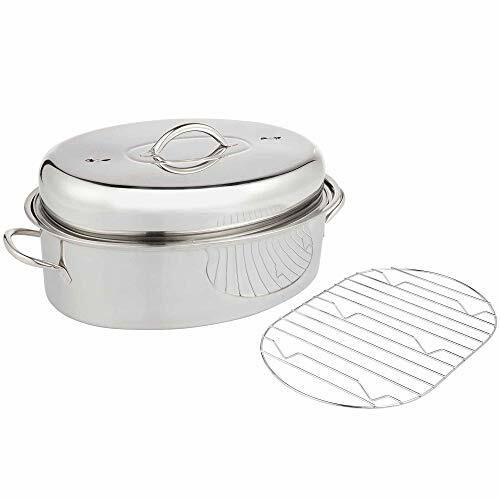 With a smart lid that gives you control over how crispy or juicy you want your meat to be, to the stainless steel build which heats evenly to offer a balanced final result, you’ll wonder how you ever managed Thanksgiving dinner without it. Dimples in the lid’s interior encourage steam to condense and drip back over the contents of the tray for an even juicier roast. Want a crispier finish? Let out that excess water through the optional steam vent. Durable, corrosion resistant and oven safe to 480°F. Provide a secure grip on heavy loads. With a flat wire rack, your food is elevated from the base of the roasting tray to allow the air to circulate all around it, delivering an even, crispy roast all over. The final result is healthier too, as fat is drained away from the meat. Constructed entirely using durable stainless steel, the roasting tray, lid and flat wire rack offer excellent thermal conduction and retention, heating evenly to give your meat, poultry, fish and vegetables a deliciously balanced roast. DISHWASHER SAFE - entire set is dishwasher safe for easy cleaning. Dimensions: L19" x D12" x H8.5".